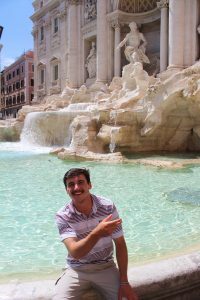 My experiences abroad in Italy, France and Germany, have been some of the most eye-opening in my life. My understanding of the world and my place in it will never be the same. I had the privilege of seeing things I have only dreamed of, and they far exceeded my expectations. My journey was alongside two good friends, and together we haphazardly made our way through history. Still clinging to our trekking poles after our journey across Spain on the Camino de Santiago, we flew to Rome as freshly minted pilgrims. Stepping out of the plane and into our bus, we realized for the first time that there would be no yellow arrows to direct our steps. We were on our own in a city of nearly 3 million people. 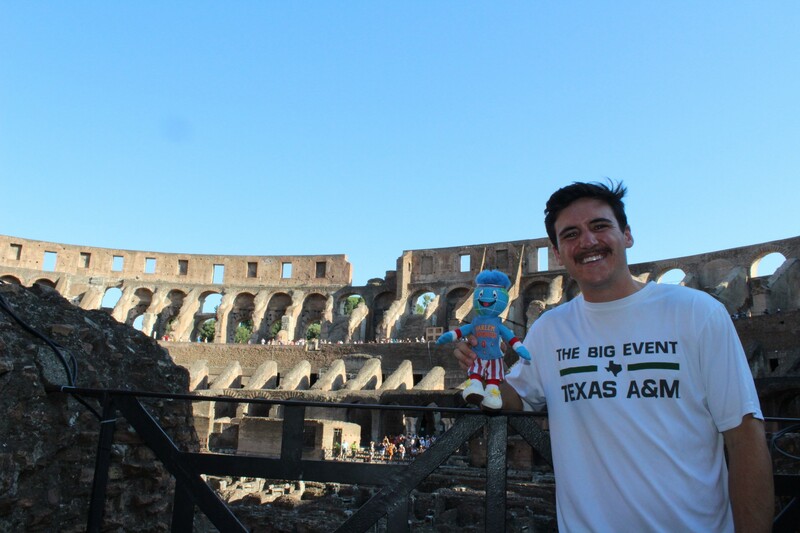 Looking back, Rome was not the best city to begin our travels. It is a large city with seriously outdated public transportation. That coupled with three inexperienced travelers led to many mishaps. 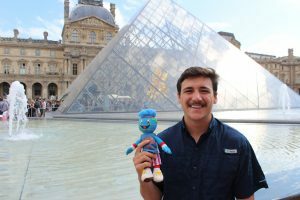 From missing the bus to getting on the wrong bus altogether, there were many mistakes that though frustrating in the moment, have led to some of the best memories on the trip. Waiting to hear Pope Francis at St. Peter’s Basilica in Rome. Rome for us primarily consisted of Vatican City. By sheer luck we were in Rome during St. Peter’s feast day, one of the largest annual celebrations of the city. 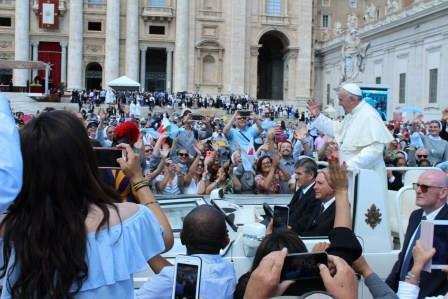 Our trio was able to blunder our way into a mass held by the Pope in the courtyard of St. Peter’s Basilica–a sight that I will never forget. 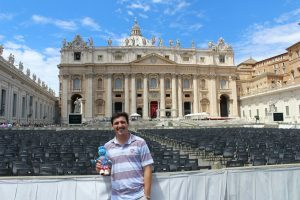 We spent a total of two days at the Vatican that included the mass and a tour of the Sistine Chapel and St. Peter’s Basilica. Before heading for Florence, we made sure to see some famous landmarks, including the Coliseum, the Trevi Fountain, and every gelato shop I could afford to stop at. Making a wish at the Trevi Fountain. Within minutes of arriving in Florence, I could tell that this was an entirely different city than Rome. Florence is by no measure a small city, but everything is much more centralized. This made for enjoyable strolls through the city heading from one location to the next. First up on our list: Michelangelo’s David. It may seem odd that I am waiting until now to expound upon the artwork that I was lucky to see, especially given my time in the Sistine Chapel. It is for a purpose, however, as Michelangelo’s David stole my heart. I have never been one for paintings or artwork in general, but this trip helped me realize I am very much a fan of larger-than-life sculptures that effortlessly capture the human experience. With the aid of Rick Steve’s audio guide, I was taken to biblical times as David stared down Goliath with a sling in one hand and a stone in the other. Without a single flaw in the massive slab of marble, I was shocked to learn that all of Michelangelo’s work was entirely free-hand. He never used a smaller model or drew out his chisel cuts like other sculptors at the time. Michelangelo’s David at the Galleria dell’Accademia in Florence. 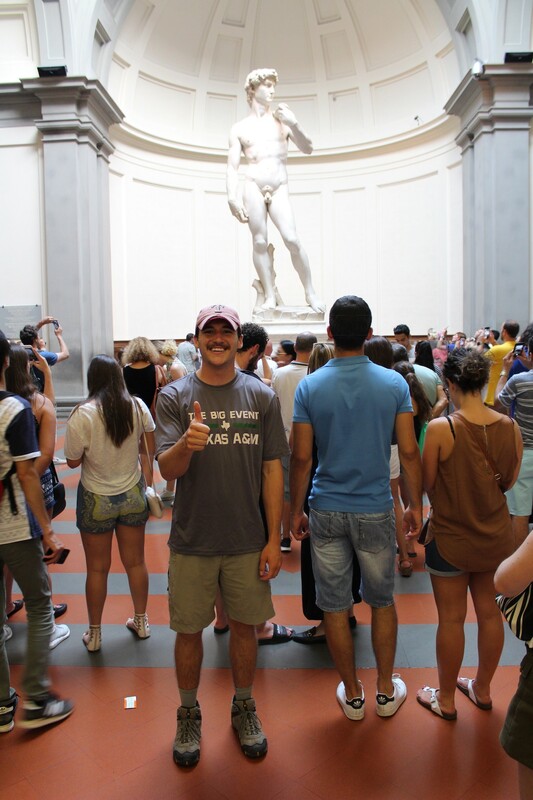 Continuing from David, Florence held many wonders. From the Duomo to the Uffizi, Florence was a vibrant city filled with rich history. One of my favorite memories here was going leather shopping on our last day. Using our handy guide book, we were able to locate a leather district a little outside of the city center, where prices were more favorable without sacrificing any of the legendary Italian leather quality. 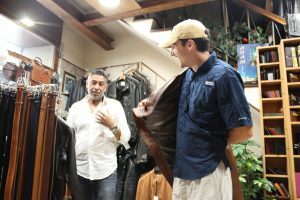 Buying a leather jacket in Florence. I have long had a picture in my mind of me wearing a pair of Aviators with a sleek leather jacket, and I intended on making that dream a reality in Florence. 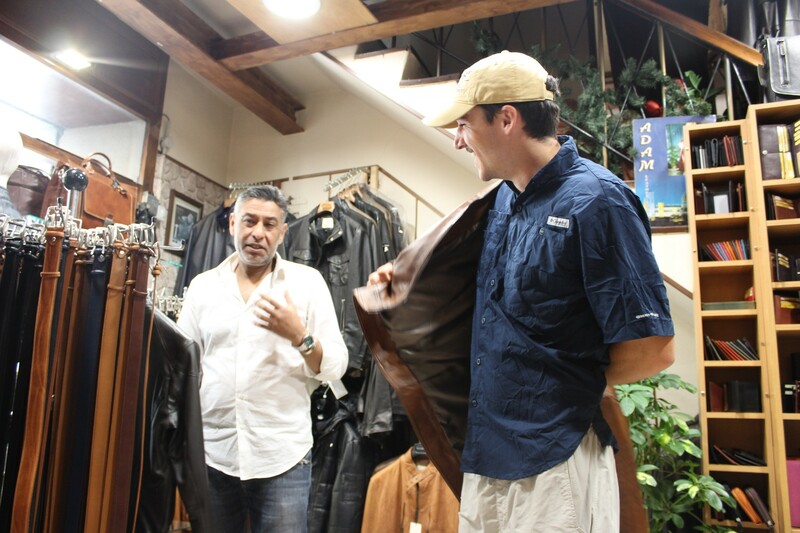 Stepping into a local shop, we were quickly greeted by the owner and shown to the jacket room. There he used every sales tactic in the book and I was his willing customer. I was ready to buy, but before I did I needed to consult my most trusted fashion expert–my mom. I took a chance and FaceTimed her at 3 a.m. her time. Luckily, she was up late and I began showing off my new look. Once I had her approval, I gladly purchased a souvenir that will last a lifetime. Italy up to this point had been very exhausting. We knew we had limited time so we were often literally running from one thing to the next. Our next stop, however, was filled with a strict schedule of relaxation. Cinque Terre was simply beautiful. It is a coastal region in Italy consisting of five towns, each one more breathtaking than the last. Our time here was just as you’d expect at one of the world’s most notable beaches. We lounged, soaked up some sun, and ate as much gelato as we could in our last Italian city. Nice, a gorgeous city along the French Riviera, was a continuation of the laid-back lifestyle enjoyed in Cinque Terre. We spent our days watching the waves roll by and our evenings watching the World Cup. Yes, we were in France during the World Cup that France won! But I am getting ahead of myself. Actually, throughout our entire time in Europe the World Cup was taking the continent by storm. We couldn’t have been there at a better time, especially considering the U.S. did not make it for the first time since 1986. In Cinque Terre, we had a memorable experience of watching England play Sweden in the Quarterfinals in a British Pub. We were quick to make friends with some Englishmen, as we were the only people there who spoke English. My biggest take away from that experience was perception. Both parties involved thoroughly enjoyed dispelling each other’s misconceptions and talking of the countries we loved. From politics to everyday life, I learned so much more connected us rather than separated us. After the rest of two coastal cities, we hopped on a six-hour train to Paris. Paris held many wonders for us, and we were thankfully much better equipped to navigate such a large city after our experience in Rome. First stop on our list–the Champagne Region. We spent an entire day out here with a private tour experiencing both small and large champagne houses. We sipped on Dom Perignon while learning about the history and significance of the region. It was unlike any tour I have ever been on, and I greatly appreciated the expertise of our guide. The next day we rose early and went to the grandiose Palace of Versailles. 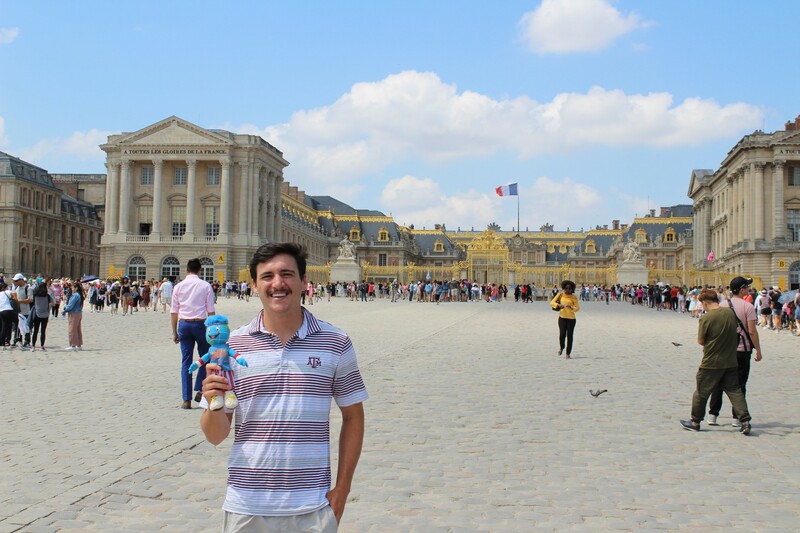 Again, we used the Rick Steve’s audio guide and were blown away by the grandeur of King Louis the XIV. We had to constantly remind ourselves that this was actually someone’s home, not a museum. The Gardens of Versailles did not disappoint either, and my favorite part was Marie Antoinette’s Village. This quaint section of the garden is hidden to the side behind rows of massive hedges, and served as Queen Antoinette’s personal escape from the stressors of royal life. That night we experienced the World Cup at its finest. We saw France play Belgium in the Semifinals! We had to crane our necks to see the game as we stood on the street outside of a bar, joined by thousands of Parisians excited to see their country win. We shared in their anxiety and eventual joy when France finally won. Thousands took to the streets as we headed to our room to avoid the chaos. We ended our time in France at the Louvre where I saw the world-famous Mona Lisa and a few more sculptures by Michelangelo. From there we caught another six-hour train to Munich. Capping off our three-week-long journey, we spent a few days in Munich. We visited the famous Hofbrauhaus, had delicious bratwurst, and toured the national headquarters and assembly plant of BMW. What I want to focus on, however, was my time at the Dachau concentration camp. This was the finale to our trip, and something that I had been looking forward to for years. After the 30-minute bus ride to the town of Dachau, we stepped off at the museum entrance where we were to meet up with our guide for the day. She was an American who moved to Germany and now voluntarily gave tours at Dachau because of her love for history and her conviction for what happened there to never be forgotten. She was hands-down the best tour guide I have ever had. She was incredibly knowledgeable and gave a complete history of the Holocaust, WWII, and how something this horrible was able to happen. I could triple the length of this report talking about all I had seen and experienced in this one day, but some things must be experienced in person for someone to fully grasp the weight of it. Instead, I will explain what I left with. The biggest thing that stuck with me from the tour was a German woman from Dachau who spoke briefly about others’ perceptions of the city today. She was a sweet woman and she was saddened that the concentration camp is the only thing that comes to peoples’ mind when they hear of Dachau. She spoke of her family and her long life in the city that she grew up in and loved. She was not trying to discount what happened at the concentration camp, but dispelled the notion that that is the only defining thing of Dachau and Germany as a whole. I realized then that people are not defined by their ancestors, nor people groups by the history of their forefathers. She and the many other joyous experiences I had in Germany are what I think of now when someone mentions Germany, not Hollywood scenes of murder and suffering. At the end of the tour, our guide gave us a reading list that she recommended to everyone if they were interested in learning more about the Holocaust. Night by Elie Wiesel stood out to me and I read it on the plane ride home to the states. Elie’s recounting of his time as a slave to the Nazi’s has impacted me beyond what I thought possible. The Nobel Laureate’s bold recount of what happened to him brought tears to my eyes more than once. I mention this as a recommendation as I am unable, again, to do such an experience justice with my own words. This trip has been something that has not stayed in Europe. Those experiences and encounters are things that I carry with me every day at home and in school. I sincerely thank the people behind the Globetrotter Grant, as none of this would have been possible without their generosity. I went to Europe naïve, thinking that I knew all there was to know about the countries I was about to go to, and returned slightly wiser, realizing I still know very little. Thank you again, and to all yearning to go abroad, there is no better time than now!